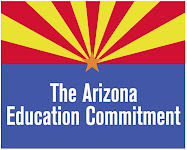 Arizona Education Network: Tell Sen. Melvin: Felons & Lawbreakers have NO PLACE near our schools! Tell Sen. Melvin: Felons & Lawbreakers have NO PLACE near our schools! This week, we learned of the ultimate insult and attack on public education in Arizona. Senator Melvin from LD26 recently announced his intent to supplement everyday labor on school campuses and facilities with prison labor. Yes, the Senator seems to think that this ‘proposed’ cost saving measure is an act that will be appreciated by his constituents as he attempts, yet again, to deny public schools of ANY expense that is borne by the state of Arizona. The bottom line here is simple. Felons, convicts and individuals stripped of their rights as a result of their court ordered period of incarceration have NO PLACE mingling with (for any reason) our most precious resource, the children of Arizona. We must all speak out loud on this one. Please consider contacting Senator Melvin directly and expressing your outrage. Tell him in no uncertain terms that felons and lawbreakers have NO PLACE near our schools. Oh, for crying out loud. Really Melvin?!?! This is the best you can come up with to help Arizona budget woes?!?!? We parents shall remember this come November!